[Specification]: White crystal powder, density is 1.40g/cm3(at 25°C). Melting point is 209-211°C, it is soluble in water and alcohol, almost insoluble in ethylether and benzene, stable when dry, non-flammable. [Usage]: Mainly used as a raw material for the manufacture of guanamine, gibuanide, various resins, trimeric cyanamide, fire retardant etc. Used as filler in leatherette and as additive in adhensive agent. Also used as material for making guanidine nitrate, sulfadiazine, virusin etc. 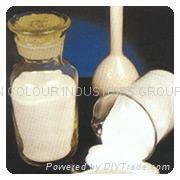 In dyeing industry, it is used for making dye auxiliaries. It is used for making accelarator of vulcanizing in rubber industry and formaking colour fixatives in printing and dyeing industry; for making hardensing agent on the surface of iron and steel; for making synergist in chemical fertilizer industry. met each, stored in cool, dry and ventilated warehouse Prevent from moisture and handle with care in transportation and loading and unloading. Calcium content : 200ppm max.